A nontoxic alternative to ethidium bromide, Fast Blast stains DNA deep blue in both agarose and polyacrylamide gels, providing vivid, consistent results. Fast Blast dye molecules are positively charged and, when placed in an agarose gel, will migrate toward the negative electrode during electrophoresis, providing a striking and inexpensive visual demonstration of the movement of molecules during electrophoresis. Stain DNA in agarose gels after electrophoresis in less than 15 minutes or overnight. 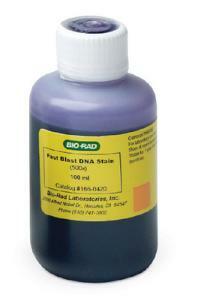 Fast Blast DNA stain is packaged as 100 ml of a 500x concentrate that must be diluted before use.